Earlier this week, I had another of my periodic trips down to MIT to visit with collaborators, and, like usual, I used it as an opportunity to check out some additional restaurants, since Cambridge and Somerville have all sorts of great dining spots. This time, I was craving Persian food, particularly since rural NH is particularly lacking in Middle Eastern places. Looking over the offerings near MIT, I ended up picking Kolbeh of Kabob, across the street from Cambridge Hospital. 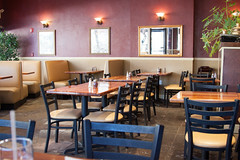 Walking in from a particularly dismal sodden street scene (for an area that gets so much snow, Greater Boston seems particularly dismal at clearing it, especially from sidewalks), once inside the door it was warm, dry, and I was immediately welcomed by the friendly staff who promptly sat me down and had me drinking some hot tea and sitting with a basket of fresh pitas with hummus. Looking over the menu, they’ve got a rather nice assortment of kabobs, falafel, and related wraps and sandwiches. Seeing that I was in the mood for some nice chicken, I ordered up the lunch special chicken joojeh plate. About 10 minutes later, the waitress brought out a rather large plate with a good pile of rice, several large chunks of nicely seared and marinated chicken, a Persian salad of cucumber and lettuce, and another nice serving of hummus. Considering that I was craving some good spicy Persian food, this really hit the spot: the chicken was very nicely marinated in a rich and tangy saffron marinade, nice and moist in the interior, and served up with a nice crispy sear. As kabob went, this was quite good. 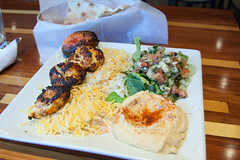 Add in both a pleasant salad and some really rich and flavorful hummus, and this was a great place for lunch. Kolbeh of Kabob turned out to be a very pleasant and friendly place for lunch, with the staff very helpful and talkative, and especially by Cambridge standards, the food was quite plentiful, affordable, and very flavorful. I’ll be back.